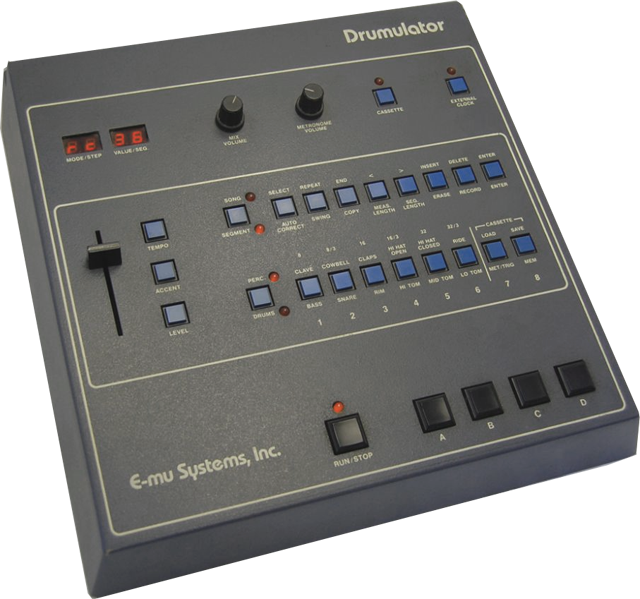 Our Drumulator came unexpanded, and we first sampled it in that form, so the onboard kit is preserved perfectly. Then we got busy with the screwdriver and installed three aftermarket EPROM expansions to get some extra tones out of the thing. The result is a great selection of tight, powerful drum sounds that can really drive a pulse through a mix. Naturally we’ve also included some processing to pull things together – a touch of Saturation and a twist of the Pump knob and the Drumulator Plus really comes alive! This is a perfect way to get the early-80s high-end sound into your tracks. The extra banks cover a batch of custom kicks, an electro kit with a very 80s vibe, and a full kit ‘borrowed’ (i.e. nicked) from the Fairlight itself. The best thing about these kits is that they have that classic early digital sound, but aren’t clichés – they feel of their time but not tired. We were very impressed! 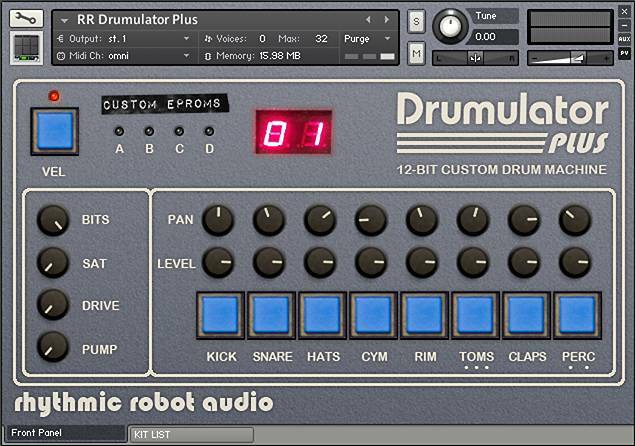 Playing around with the Drumulator is tremendous fun – those cool blue buttons and red LEDs, a nice easy-to-use realtime sequencer, and that great pumping wall of sound… this is a seriously powerful machine. Our version lets you slot that power straight into your DAW of choice. Time to get funky! Yep. This pops right out in a mix, and the EPROMs give you a nice variety. Killer! Sounds Awesome, also great when you have it hooked up to a sequencer, like my beatstep pro. Love making 80s retro and this is exactly what I’m looking for. Wonderful interface, super sounds, bonus kit, £ 5 but what more can you ask for? The sounds are very “period appropriate” if you are going for the 80’s feel. They are also very useful on their own as alternatives to the more used up drum machine sounds. I quickly got especially fond of the kick, side stick, snare, hats and the clap. The basic kit is made out of real drum kit samples, so it goes well with pseudo-realistic programmed drums. As said in the description, indeed the extra banks provide some very useful variety and include many usable sounds. Two things I have found a bit disappointing. First, I don’t think there are any crash sounds, or at least no good ones – that is due to the nature of the original instrument, that did not have enough memory to waste on long crash tails, but still it is something to be aware off. Second, the volume knobs do not work when velocity sensitivity is turned on, thus balancing the levels has to be done by adjusting the note velocities in the track – not very comfortable. It really is a drumulator and then some (+ plus). hi, i went to get my taxes done last week (yes, extension) and my accountant (he was a drummer in the circle jerks years ago) had one of the Hardware Units in his office and he was sitting on the Floor Playing Uke and using one of these as the rhythm track .. i go to gearsltuz to help a guy find some kontakt instruments and he mentions Seinfeld Bass at Rhythmic Robots !! so i venture over here and this just caught my eye .. had to buy it .. just playing around i have a huge smile on my face .. 🙂 thx for making this instrument .. it has all the flavor of the original unit with all the options of Kontakt !! best of both worlds .. thank you thank you thank you !!! now i need to make so more money so i can pick up a few more of these Gems !! Everyone loves drums. So when I discovered a machine that does drums I just had to have it!! This is my favorite drum VST! Great real life synth emulations that sound like the hardware! makes music making a sonic and visual treat. Large variety of punchy awesomeness with RR quality sampling. May become addictive. Firstly, you can always rely on RR to produce high quality samples of their instruments, but as soon as one of my all-time favourite drum machines appeared in the form of a VST plugin, I had to have it! Plenty of punchy 80s style percussion sounds to spice up any production, and with the added extra of being able to saturate the sounds for an even bigger punch, it is an essential add-on to any DAW.